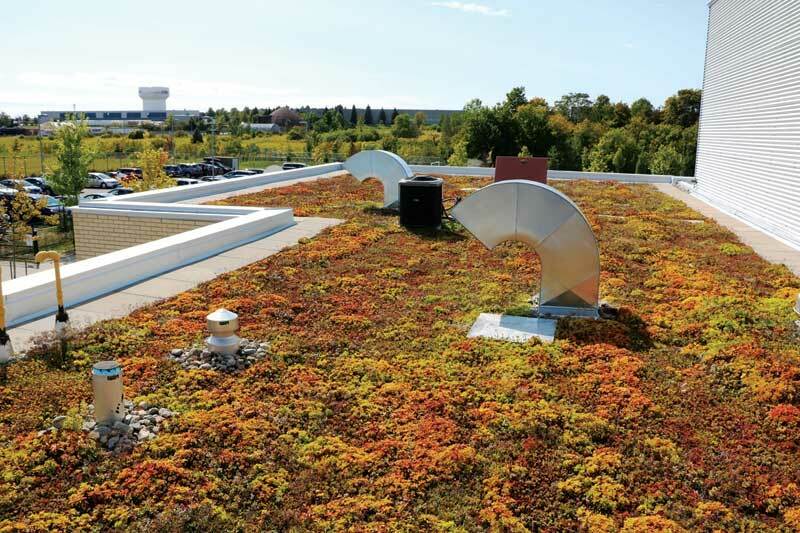 High above the ground, vegetated roofs mimic nature, helping clean the air, cooling down temperatures, keeping rainfall onsite, and alleviating pressure on urban stormwater systems. Vegetated roofs, also referred to as a green roofs, eco-roofs, or living roofs, typically include a vegetation layer, growing medium, retention layer, drainage, and a root barrier. They are present throughout North America in almost all climate zones and can be installed on various roofing assemblies. Green roofs are classified as either intensive or extensive. Intensive roofs feature a variety of plants in a heavy and deep substrate layer of250 mm (10 in.) or more. These green roofs can incorporate many sizes and types of plants foundon ground-level, including shrubs and trees. Typically installed as a rooftop amenity space, intensive roofs may include planter boxes, benches, ponds, and fountains in park-like settings. Extensive roof systems are lighter in weight because of a shallow substrate—20 to 150 mm (3⁄4 to 5.6 in. )—and they typically feature vigorous, low-growing, drought-tolerant plant species such as sedums and mosses. These systems are an economical stormwater management solution; are easier to install, remove, and repair; require less maintenance than intensive systems; and may be retrofitted on existing buildings. All vegetated roofs—whether intensive or extensive—experience cycles of growth, flowering, and dormancy like plants on the ground. When vegetated roofs are properly designed, correctly installed, and appropriately maintained for the four-season temperate climate, they have a greater probability of survival in the harsh, cold Canadian winters. This article focuses on the best autumn and winter practices for extensive vegetated roofs, which are more dominant in urban centres. (For more information, read the “2015 Annual Green Roof Industry Survey” by Green Roofs For Healthy Cities.) These roof systems are prevalent throughout Canada as a green infrastructure technology. However, many questions arise as to their esthetics, performance, and survivability in the winter. Some question whether vegetated roofs die in the cold climate, if snow damages the vegetation, can the roof be walked on in winter months, or if vegetation needs to be re-seeded in the spring. This article seeks to provide answers. 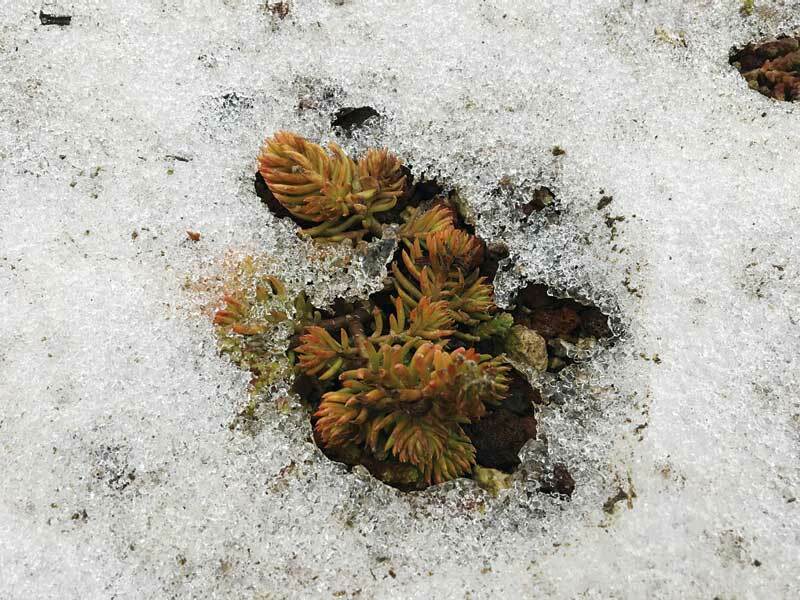 Sedum reflexum or sedum rupestre, also known as reflexed stonecrop or “blue spruce” is in dormancy under the cover of snow—the plant’s natural reaction to adverse environmental conditions. In spring and summer, this vigorous sedum species will produce yellow star-like flowers. Extensive systems predominantly use hardy sedum species that can withstand harsh rooftop conditions year-round. Sedum are drought-tolerant and thrive in harsh conditions. The best-suited rooftop plants are pre-grown outdoors locally, for at least several months and usually over winter, to make certain they are acclimatized to the local weather conditions. Ensuring the vegetation is mature upon installation offers a higher probability of survival. In colder plant-hardiness zones (e.g. Ottawa, Edmonton, and Winnipeg) or in areas where there are extreme fluctuations in temperature (e.g. Calgary due to the Chinook winds), vegetated roofs require a deeper depth of engineered growing medium to help mitigate the effects of intense temperature and moisture changes. Additional growing medium acts as a thermal mass, helping moderate the temperature and further hydrating the plants, thereby reducing significant die-back in the winter or during hot summer droughts. The growing medium for green roof systems is typically engineered to be a lightweight composition of locally and sustainably sourced ingredients. Most growing medium employed on North American green roofs is designed based on the German FLL guidelines and is tested to ASTM standards. It has consistent chemical and physical characteristics of nutrients, bulk density, air space, water retention, and hydraulic activity or drainage. Depending on what is locally available, and on the specifications required for the regional climate and roof type, growing medium is blended using horticultural aggregates—which may include sand, lava, expanded clay, and crushed slate, depending on availability—and organics (e.g. peat, humus, wood chips, and high-quality compost from grass clippings and mulched leaves).